Aexeon is a low-cost, full-featured video acquisition board for analog cameras. 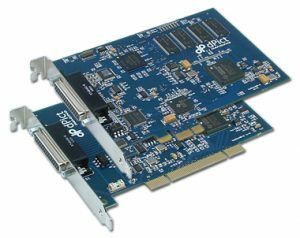 Available in either PCI or PCI Express formats, Aexeon incorporates a digital media processor and on-board frame buffer for reliable capture for the most demanding vision-related application. Aexeon's video input circuitry digitizes between multiple component, S-Video, or composite video signals in either square pixel or CCIR-601 resolutions. With plenty of I/O triggers and extensive camera control, Aexeon is the perfect frame grabber for cost-effective analog camera applications..
Aexeon can be ordered in either PCI or PCI Express system interfaces allowing for system compatibility well into the future. PCI Express is the high-performance, next-generation interconnect that increases bandwidth, scalability, and reliability. Aexeon's high speed bus-mastering capability with scatter gather support delivers real-time video data to system or display memory simultaneously, without intervention from the host CPU. Video data formatting and resolution is independent between streams, allowing for maximum bandwidth flexibility. Aexeon provides high-quality 10-bit capture from up to 3 RGB or PrPb component, 4 S-Video, or 9 composite/monochrome video sources in NTSC or PAL format. Video can be captured and stored in either square pixel or CCIR-601 resolutions, and can be scaled to any arbitrary size. Aexeon also supplies RGB or YPrPb component, S-Video, or composite video outputs in NTSC or PAL format. Video output source data is acquired from on-board memory, making it completely independent of the video input. This allows for video output not only from the currently viewed input video, but also from off-screen system memory. Graphics overlay or image processing functions can be applied to the video image before going to the video output. Interfacing and controlling cameras with Aexeon is painless. Cameras can be accessed through Aexeon's on-board RS-232 serial interface and powered through a fused12-volt power output. Aexeon has 8 programmable I/O triggers for camera integration or event triggering. Aexeon also incorporates an on-board microprocessor to guarantee accurate synchronization and robust triggering without relying on the host CPU. dVeloper is a comprehensive software developers kit that supports all dPict Imaging products, allowing for easy porting to new hardware. dVeloper is royalty free and runs under Microsoft Windows 10, 8, 7, Vista, XP, and Linux operating systems. Source code samples and complete documentation are included in Visual C, C#, and Visual Basic .NET to provide insight to various hardware functions. Samples include video-in-a-window, overlay, video buffering, camera control, and more.